Yesterday, while driving with the family to Pennsylvania, we saw lots of beautiful birch trees along the roadside. I was so inspired, that today, I painted them with alcohol ink! Yesterday was a drab day and the background was quite gray and dull. But I couldn’t help but imagine them amidst a colorful, backdrop. So in my painting, that’s just what I did… I created a very colorful rainbow ombre backdrop. As I’ll be launching the Alcohol Ink Art Community real soon, I decided to video the entire process and turn it into an alcohol ink painting class. 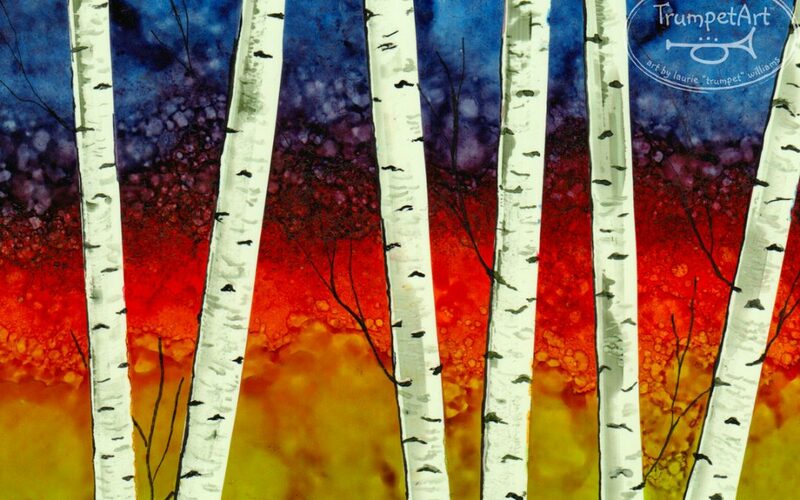 If you would like to be notified of when that class is available, visit the Alcohol Ink Art Community website and enter your email address AND/OR like the Alcohol Ink Art Community page on Facebook. I’ll let you know as soon as it’s available.